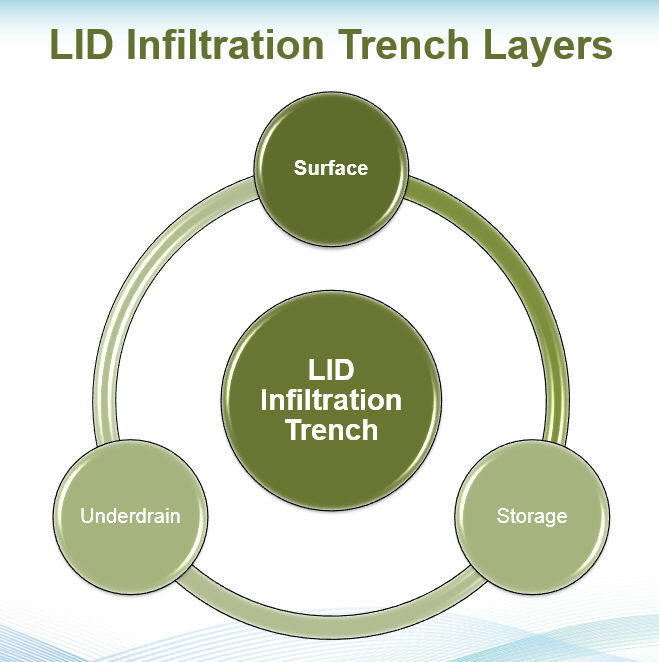 The Infiltration Trench LID Control has three components or Process Layers: Surface, Storage and Underdrain. An example of an Infiltration Trench. The three layers used in a simulation for a Infiltration Trench LID are shown in the following image. Suggested ranges for the parameters associated with infiltration trenches are listed in Table 6-5. Because there is no soil layer to slow down and retain water in excess of gravity drainage, the trench acts as a simple “storage pit” whose change in stored volume over a given time step is simply the difference between the captured runoff/rainfall rate entering through its surface and the rate of exfiltration leaving through its bottom (assuming no underdrain).